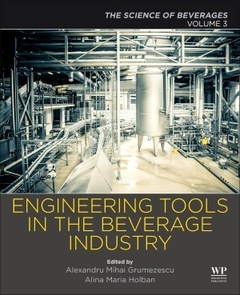 Engineering Tools in the Beverage Industry, Volume Three in the Science of Beverages series, is an invaluable resource for anyone in the beverages field who is involved with quality assurance, lab analysis and the safety of beverage products. The book offers updates on the latest techniques and applications, including extraction, biochemical isotope analysis, metabolomics, microfiltration and encapsulation. Users will find this to be an excellent resource for industrial research in an ever-changing field. Alexandru Mihai Grumezescu is a Lecturer in the Department of Science and Engineering of Oxide Materials and Nanomaterials, at the Faculty of Applied Chemistry and Materials Science, Politehnica University of Bucharest, Romania. He is an experienced researcher and published editor in the field of nano and biostructures. He is the Editor-in-Chief of 2 international open access journals: Biointerface Research in Applied Chemistry, Letters and Applied NanoBioScience. Dr. Grumezescu has published ~200 peer-reviewed papers, ~50 book chapters, and has co-authored nine books and 50 edited books. Alina-Maria Holban is a Lecturer in Microbiology and Immunology, at the Faculty of Biology, University of Bucharest; and associate Researcher at the University Politehnica of Bucharest, Romania, working on the field of bionanomaterials with antimicrobial applications. The contribution of Dr Holban in her research field is supported by the publication of 75 papers in peer-reviewed journals, 42 conference/symposia proceedings (posters and oral presentations, from which 29 were presented in International scientific meetings), 21 edited books, 20 book chapters in international books and 2 GenBank original sequences (patents). More than 50% of the published papers are investigating the applications of nanomaterials on biomedical fields.